The Second Coming (sometimes called the Second Advent or the Parousia) is primarily a Christian concept regarding a future return of Jesus to Earth after his "first coming" and ascension to heaven about two thousand years ago. The belief is based on messianic prophecies found in the canonical gospels and is part of most Christian eschatologies. Views about the nature of Jesus' Second Coming vary among Christian denominations and among individual Christians. Most English versions of the Nicene Creed include the following statements: "...he ascended into heaven and is seated at the right hand of the Father. He will come again in glory to judge the living and the dead, and his kingdom will have no end. ... We look for the resurrection of the dead, and the life of the world to come." The etymology of the Greek word parousia is related to para "beside" ousia "presence". In English "parousia" always has a special, Christian meaning. ...In the N. T. [New Testament] esp. 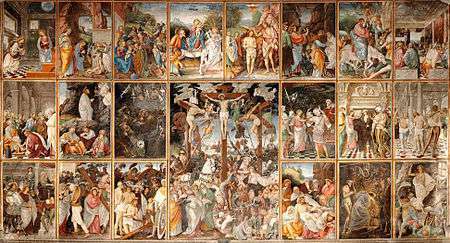 [especially] of the advent, i.e., the future, visible, return from heaven of Jesus, the Messiah, to raise the dead, hold the last judgment, and set up formally and gloriously the kingdom of God. ...of Christ, and nearly always of his Messianic Advent in glory to judge the world at the end of this age. In the New Testament the second Parousia, or coming of Christ as Judge of the world, is an oft-repeated doctrine. The Saviour Himself not only foretells the event but graphically portrays its circumstances (Matthew 24:27 sqq. [Olivet Discourse]; Matthew sqq. [Judgment of the Nations]). The Apostles give a most prominent place to this doctrine in their preaching (Acts 10:42,Acts) and writings (Romans 2:5-16; 14:10; 1 Cor. 4:5; 2 Cor. 5:10; 2 Tim. 4:1; 2 Thess 1:5; James 5:7). Besides the name Parusia (parousia), or Advent (1 Cor. 15:23, 2 Thes. 2:1-9), the second coming is also called Epiphany, epiphaneia, or Appearance (2 Thes. 2:8; 1 Tim. 6:14; 2 Tim. 4:1; Titus 2:13) and Apocalypse (apokalypsis), or Revelation (2 Thess. 2:7 1 Pet. 4:13). The time of the second coming is spoken of as "that Day" (2 Tim. 4:8) "the day of the Lord" (1 Thess. 5:2), "the day of Christ" (Phil 1:6), "the day of the Son of Man" (Luke 17:30), and "the last day" (John 6:39-40). Gustav Adolf Deissmann (1908) showed that the Greek word parousia occurred as early as the 3rd century BC to describe the visit of a king or dignitary to a city - a visit arranged in order to show the visitor's magnificence to the people. The Roman advent coins struck by the cities of Corinth and Patras for Nero's visit reveals the correspondence between the Greek "parousia" and the Latin "Adventus" and their relationship to the Greek word "epiphany" that means "appearing". Moreover, Jesus was reported to have told his disciples, "Truly I tell you, this generation will certainly not pass away until all these things have happened." (Matt. 24:34; Mark 13:30; Luke 21:32) Given that in his next statement Jesus notes that the exact day and hour is unknown even to himself, the simple meaning of his previous statement is that the Second Coming was to be witnessed by people literally living in that same generation. Some, such as Jerome, interpret the phrase "this generation" to mean in the lifetime of the Jewish race; however, other scholars believe that if Jesus meant "race" he would have used genos (race) not genea (generation). Most English versions of the Nicene Creed in current use include the following statements about Jesus: "...he ascended into heaven and is seated at the right hand of the Father. He will come again in glory to judge the living and the dead, and his kingdom will have no end. ... We look for the resurrection of the dead, and the life of the world to come. Amen." It is the traditional view of Roman Catholics and Orthodox Christians, preserved from the early Church, that the second coming will be a sudden and unmistakable incident, like "a flash of lightning". [Mt 24:27] They hold the general view that Jesus will not spend any time on the earth in ministry or preaching. They also agree that the ministry of the Antichrist will take place right before the Second Coming. Orthodox layman Alexander Kalomiros explains the original Church's position regarding the Second Coming in River of Fire and Against False Union, stating that those who contend that Christ will reign on earth for a thousand years "do not wait for Christ, but for the Antichrist." The idea of Jesus returning to this earth as a king is a heretical concept to the Church, equated to "the expectations of the Jews who wanted the Messiah to be an earthly King." The Church instead teaches that which it has taught since the beginning—Christ will not return to earth, rather the Kingdom of Heaven, the New Jerusalem, will be established through the Resurrection of the dead. A short reference to the second coming is contained in the Nicene Creed: "He [Jesus] shall come again in glory to judge the living and the dead; and His kingdom shall have no end." An analogous statement is also in the biblical Pauline Creed. [1Cor 15:23]. Recent surveys show that about 40% of Americans believe that Jesus is likely to return by 2050. This varies from 58% of white evangelical Christians, through 32% of Catholics to 27% of white mainline protestants. Victor J. Stenger notes that Jesus is recorded as saying, " ...there are some standing here, which shall not taste death, till they see the Son of Man coming in his kingdom ", Matt 16:28. He makes similar predictions in four other places in the Gospels; Mark 9:1, Mark 13:30, Matt 24:34, Luke 9:27. In Stenger's view, when the coming did not happen within the life-times of his disciples, as Jesus prophesied, Christianity changed its emphasis to the Resurrection and promise of eternal life. Bahá'u'lláh announced that the Return of Christ, understood as a reappearance of the Word and Spirit of God, was manifest in His Person. Baha'u'llah wrote to Pope Pius IX, "He Who is the Lord of Lords is come overshadowed with clouds...He, verily, hath again come down from Heaven even as He came down from it the first time. Beware that thou dispute not with Him even as the Pharisees disputed with Him without a clear token or proof." He goes on to refer to Himself as the Ancient of Days and the Pen of Glory. Baha'u'llah also said in this connection: "This is the Father foretold by Isaiah, and the Comforter concerning Whom the Spirit had covenanted with you. Open your eyes, O concourse of bishops, that ye may behold your Lord seated upon the Throne of might and glory." Baha'u'llah also wrote,"Say: We, in truth, have given Ourself as a ransom for your own lives. Alas, when We came once again, We beheld you fleeing from Us, whereat the eye of My loving-kindness wept sore over My people." Followers of the Bahá'í Faith believe that the fulfillment of the prophecies of the second coming of Jesus, as well as the prophecies of the Maitreya and many other religious prophecies, were begun by the Báb in 1844 and then by Bahá'u'lláh. They commonly compare the fulfillment of Christian prophecies to Jesus' fulfillment of Jewish prophecies, where in both cases people were expecting the literal fulfillment of apocalyptic statements. Bahá'ís claim that the return of Christ with a new name parallels the return of Elijah in John the Baptist as stated by Jesus in the Gospels. In Islam, Jesus (or Isa; Arabic: عيسى‎‎ ʿĪsā) is considered to be a Messenger of God and the Masih (messiah) who was sent to guide the Israelites (banī isrā'īl) with a new scripture, the Injīl. The belief in Jesus (and all other messengers of God) is required in Islam, and a requirement of being a Muslim. In the Quran, the second coming of Jesus is heralded in Az-Zukhruf (the Quran's 43rd surah or chapter) as a sign of the day of judgement. 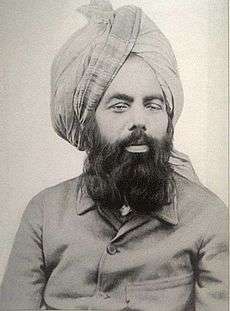 The Ahmadi sect, who identify as Muslims, believe that the promised Mahdi and Messiah arrived in the person of Mirza Ghulam Ahmad (1835–1908). This is rejected by mainstream Muslims, who consider the Ahmadiyya not to be Muslims. Regarding the Christian idea that these prophecies will be fulfilled during a "second coming," Ohr Samayach states "we find this to be a contrived answer, since there is no mention of a second coming in the Jewish Bible. Second, why couldn't God accomplish His goals the first time round?" Rabbi David Wolpe believes that the Second Coming was "grown out of genuine disappointment" and invented by Christians to theologically compensate for Jesus' death. ↑ "Greek Lexicon :: G2015 (KJV)". Blue Letter Bible. 1 2 "Strong's G3952". Blueletterbible.org. Retrieved 2009-11-21. ↑ "Parousia - Definition of Parousia by Merriam-Webster". Merriam-Webster. 2007-04-25. Retrieved 2009-11-21. 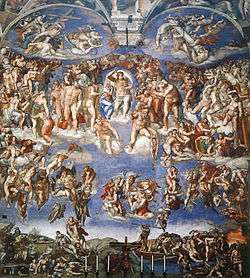 ↑ "CATHOLIC ENCYCLOPEDIA: General Judgment (Last Judgment)". Newadvent.org. 1910-10-01. Retrieved 2009-11-21. ↑ Gustav Adolf Deissmann (1908). Light from the Ancient East:The New Testament Illustrated by Recently Discovered Texts of the Graeco-Roman World. ↑ Freeman, Charles. The Closing of the Western Mind, p. 133. Vintage. 2002. ↑ Austin Best. "White Horse Media". whitehorsemedia.com. ↑ "Is Jesus Coming Soon?". google.ca. 1 2 "Jesus is Coming Soon". Orthodoxphotos.com. Retrieved 2009-11-21. ↑ "THE RIVER OF FIRE". Saint Nectarios Press and Book Center. ↑ "Against False Union" (PDF). Russian Orthodox Autonomous Church (ROAC) of America. ↑ Paul E. Engle and John H. Armstrong, eds., Understanding Four Views on the Lord’s Supper, Zondervan Counterpoints Collection (Grand Rapids, MI: Zondervan, 2007), 46. ↑ Tabletalk Magazine, March 2005: The Exaltation of Christ (Lake Mary, FL: Ligonier Ministries, 2005), 11. ↑ "Chapter 43: Signs of the Second Coming", Gospel Principles, Salt Lake City, Utah: LDS Church, 2011, pp. 251–256 . ↑ "Second Coming of Jesus Christ", Study Helps: Gospel Topics, LDS Church, retrieved 2014-07-09 . ↑ "28 Fundamental Beliefs of the Seventh-day Adventists" (PDF). p. 11 (last page) of the pdf file. ↑ "Appendix 5B Christ's Presence (Parousia)", New World Translation—Large Reference Edition, Watch Tower Society, 1984. ↑ "Presence", Insight on the Scriptures - Volume 2, ©1988 Watch Tower, page 677. ↑ "1900 Onward—Skirts Splattered With Blood". Awake! : 22. November 8, 1989. ↑ "Keep Jehovah's Day Close in Mind". The Watchtower: 21. September 1, 1997. ↑ "'No Peace for the Wicked Ones'". The Watchtower: 13. July 1, 1987. ↑ "There Is a Future for the Dead". The Watchtower: 200. April 1, 1968. ↑ "Public Sees a Future Full of Promise and Peril Section 3: War, Terrorism and Global Trends". Pew Research Center. June 22, 2010. Retrieved Feb 1, 2016. ↑ Baha'u'llah (2002). The Summons of the Lord of Hosts. Bahá'í World Centre: Bahai World Centre. pp. 54–55. ISBN 978-1-931847-33-9. 1 2 Baha'u'llah (2002). The Summons of the Lord of Hosts. Haifa, Israel: Bahai World Centre. p. 57. ISBN 978-1-931847-33-9. ↑ Baha'u'llah (2002). The Summons of the Lord of Hosts. Haifa, Israel: Bahai World Centre. p. 63. ISBN 978-1-931847-33-9. ↑ "Baha'i: Prophecy Fulfilled Homepage". bci.org. ↑ Lambden, Stephen. "Catastrophe, Armageddon and Millennium: some aspects of the Bábí-Baha'i exegesis of apocalyptic symbolism". Bahai-library.com. Retrieved 2009-11-21. ↑ Yusuf Ali, Abdullah. "Surah Az-zukhruf". ↑ kathir, Ibn. "Tafsir al-Qur'an al-Azim". ↑ "Why Jews Don't Believe in Jesus", Ohr Somayach - Ask the Rabbi. Accessed December 22, 2011. ↑ Prence, Patience (July 27, 2010). SCARS: Christian Fiction End-Times Thriller. Spring Harvest. ASIN B003XKNF1K. ↑ Pinsker, Scott (June 5, 2014). The Second Coming: A Love Story. ASIN B00KT6B3G0. ISBN 1500167215.